Your Points! Your Rewards! Your Savings! If you forgot password or ID, CLICK HERE. Professional calendar printing is a highly intricate process, requiring specialized equipment and flawless attention to detail. If you’re a designer, marketer, or other trade professional on whom consumers rely for quality printed materials, Color FX Web can provide you with the wholesale calendar printing solutions that you need to bring your customers’ visions to life. We fulfill custom calendar printing orders in three sizes: standard 11” x 8.5”, medium 11” x 11”, and large 12” x 12”, with or without covers. 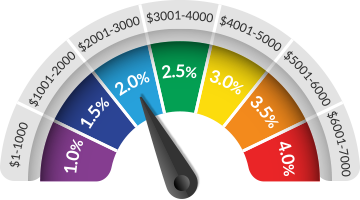 Within these size ranges exists an almost infinite range of customizable options. Looking for 100# glossy book paper? We’ve got that. How about the number of pages? We offer 28 page lengths as standard, but we can customize your order as needed. We offer from 500 to 30,000 calendars per order, and anything in between. And that is only the beginning of our available options. We can mix and match paper weights, ink types, paper coatings, special bindings, printing sides, quantity, and turnaround times to provide the ultimate in customization for your customers. Why wait? Register with Color FX Web today. At Color FX Web, we take pride in every custom calendar printing order. Our specialized customer service means that we may take a bit longer than the competition, but unlike the competition, we can guarantee your order will have the lowest redundancy and the fewest mistakes. We care about your needs just as much as you care about the needs of your customers. The best way to maintain our #1 rank among printers in the state of California year after year is to make sure your order is just what you’re looking for, every single time. Color FX Web only uses the most state-of-the-art equipment, so that every item in your bulk calendar printing order looks just as good as your business does. We only print on paper with up to 55% post-consumer content and only with soy-based inks, so that the environmental cost of your order is as low as the purchase price. At Color FX we are just as tired of answering machines as you are. That’s why our business is minimally automated in terms of customer service. When you place an order, you will only ever talk to a living, breathing human being. At Color FX Web, we feel that every order is unique and deserves a personal, human touch. While this makes our customers feel better, we don’t do it just for the personal aspect. Shepherding your order from placement to fulfillment means far fewer mistakes than with our more automated wholesale competitors. Our talented customer service team is waiting to answer your questions or place your orders at (877) 763-7671. For all your wholesale calendar printing needs, call Color FX Web today! 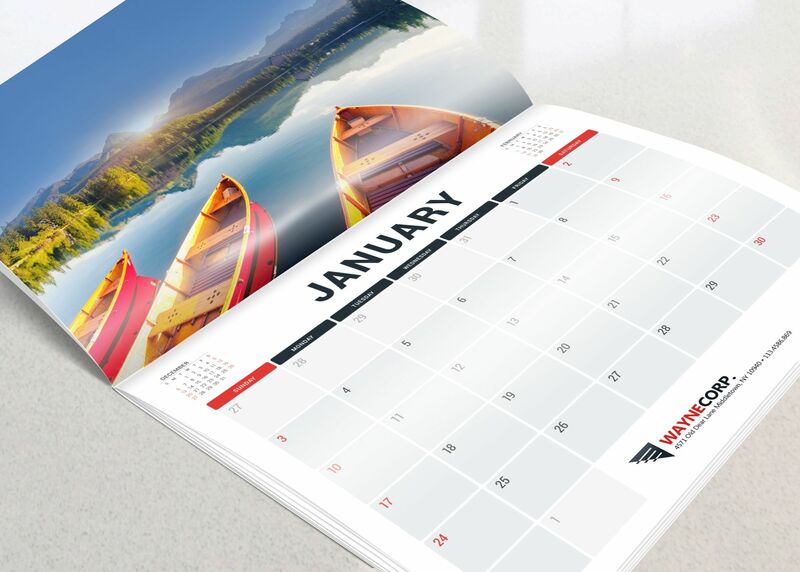 Standard Calendar Printing: Printed on 100# or 80# Gloss Book Full Bleed with AQ Coating OR 70# Offset Book without Coating, Folded to 11"x 8.5" 2 places on 11" height Saddle Stitched with 3 side flush trimmed with 3/8" Hole 1/2" From edge of paper on 11" side. Standard with Cover Calendar Printing: Printed on 100# or 80# Gloss Book with Dull or AQ Coating OR 70# Offset Book with No Coating. Cover is 100# Gloss Cover with Dull or AQ Coating Folded to 11"x 8.5" 2 places on 11" height Saddle Stitched with 3 side flash trimmed with 1/8" Hole 1/2" From edge of paper on 11" side. Medium Calendar Printing: Printed on 100# or 80# Gloss Book Full Bleed with AQ Coating OR70# Offset Book without Coating, Folded to 14"x 8.5" 2 places on 14" height Saddle Stitched with one bottom center 3/8" hole. Medium with Cover Calendar Printing: Printed on 100# or 80# Gloss Book with Dull or AQ Coating OR 70# Offset Book with No Coating. Cover is 100# Gloss Cover with Dull or AQ Coating Folded to 14"x 8.5" 2 places on 14" height Saddle Stitched with 3 side flush trimmed with 3/8" Hole 1/2" From edge of paper on 14" side. Large Calendar Printing:Printed on 100# or 80# Gloss Book Full Bleed with AQ Coating OR 70# Offset Book without Coating, Saddle Stitched on 12" and Folded to 12" x 12" with 3 side flush trimmed with 3/8" Hole 1/2" from edge on 12" side. Large with Cover Calendar Printing: Printed on 100# or 80# Gloss Book with Dull or AQ Coating OR 70# Offset Book with No Coating. Cover is 100# Gloss Cover with Dull or AQ Coating Saddle Stitched on 12" and Folded to 12" x 12" with 3 side flush trimmed with 3/8" Hole 1/2" from edge on 12" side. Please Note: Any quantity up to 2500 on 70# offset uncoated text paper will be printed digitally and is not compatible with most of the laser printers. Please contact us regarding Mailing Services fee for Calendars. 8.5 x 11: 100# Gloss Book, 24 pager: 2,500 qty. - 160 per box - 16 boxes @ 38lbs. = TOTAL weight of 600lbs.